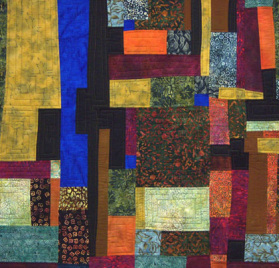 Susan Webb Lee works almost exclusively with textiles, and creates one-of-a-kind quilts for walls. She has been a studio artist for the past 30 years, and continues to explore new directions with her quiltmaking, fabric dyeing and printing, and color compositions. Her work isn't easily catagorized into any signature style that is continued from year to year. Rather, she approaches her work with an experimental attitude, focusing on the production of the art itself and letting it lead her into new realms of discovery. Her primary interests lie in structure, rhythm, and the relationships of color. Susan has been a juried member of the Southern Highland Craft Guild since 2005, and has exhibited with them at the U.S. Cellular Center in Asheville. Also, she has quilts for sale at the Folk Art Center in Asheville, one of the retail spaces for the Southern Highland Craft Guild artists. She has also been an exhibiting artist with the Piedmont Craftsmens Guild in Winston-Salem, NC since 1986. They hold a 2-day event and sale at the Benton Convention Center every November and feature spectacular work from many regional artists. Susan's quilt "Versicolor" was purchased by the Mayo Clinic for inclusion in their permanent collection. In the summer of 2013 Susan was accepted into an exhibition sponsored by the Studio Art Quilt Associates entitled "Color Wheel of Emotion." 19 quilts were chosen from 268 entries. The show travelled through August of 2014, and was at venues in Manchester, New Hampshire, Philadelphia, PA, Santa Clara, CA, among others. Also, Susan was invited to participate in "Making It," August 12 - October 3 at the Cabarrus Arts Council in Concord, NC. The galleries are located in the renovated historic Courthouse where Susan had 4 quilts on display. Piedmont Craftsmen in Winston-Salem, NC had their 50th anniversary in 2013, and to celebrate, they are had several special events. One was an exhibit called "Born from the Hand - The Definitive Era" which was shown at the Milton Rhodes Center for the Arts. Susan had 2 quilts there from October 18 - Nov. 30. Another show was at the Piedmont Craftsmen's gallery in Winston-Salem, NC. Artists were invited to use the Piedmont Craftmen's "Hand" logo to create a work of art. 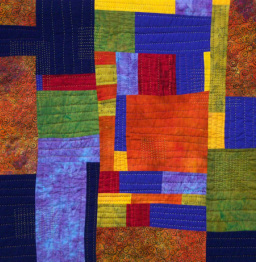 Susan had a colorful hand-dyed quilt included in this show which ran throughout the month of November. 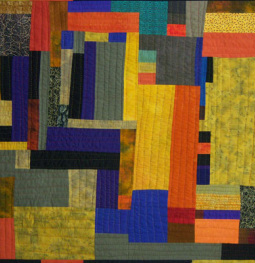 During the month of October, Susan showed her quilts at the NC Crafts Gallery in Carrboro, NC. Along with Susan, Sondra Dorn and Norma Bradley were also included in the exhibition. The gallery is located at 212 W. Main St. Call 919-942-4048 for more info. Susan lives in Fairview, NC, just a short drive east of Asheville. Contact her at 828-606-0091.